Hyperscale Data Center Market size is set to exceed USD 65 billion by 2025; according to a new research report by Global Market Insights, Inc.
Rise in the demand for big data and cloud computing solutions in distributed computing environments is expected to drive the hyperscale data center market. Rapid increase in data traffic is the major challenge for organizations to store, manage and retrieve the massively growing data. The companies are adopting cloud computing solutions for its increased benefits such as flexibility, reduced IT expenses, scalability, collaboration efficiency and access to automatic updating and storage of large volume of data. Rapid increase in business data is encouraging the large enterprises to invest heavily in IT expansion. For instance, in August 2018, Google announced its plan to expand its data center in Singapore to scale up capacity and meet increasing demand for services. In addition, the company will invest USD 600 million to expand its South Carolina facility. The growing popularity of cloud-based infrastructure and investments to expand the product portfolio are contributing in the market growth. The demand for rack-based Power Distribution Units (PDUs) is growing rapidly in the hyperscale data center market due to their high availability and high-power ratings features. These PDUs can be incorporated with all types of rackmount equipment without interrupting the power supply. It helps organization to reduce power consumption, thereby enhancing the efficiency of an IT facility. These solutions also help in reducing an organization's carbon footprint. It is being widely adopted by businesses for enhancing the business efficiency. For instance, in February 2019, Eaton Corporation launched its high-density rack PDU platform in North America with advanced configurability features for customers. Increase in adoption of cloud-based services and rapid growth in smartphone and social media users in Asia Pacific is expected to drive the market size. The number of smartphone users is expected to cross 6 billion by 2025 with countries such as India, China, South Korea, Taiwan, and Indonesia being the major contributors. Businesses in the region are adopting data-intensive applications such as IoT, data analytics, AI services which needs high amount of data and large capital investments. Several companies are constructing hyperscale facilities to reduce their capital and operational expenses. For instance, in February 2019, CtrlS announced its plan to build hyperscale facility in India to handle the complexity of exploring data and the increasing demand on IT service. 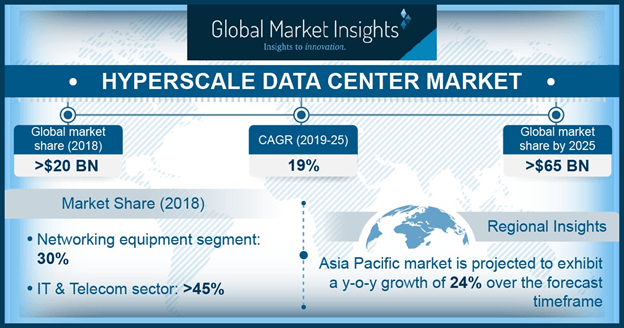 In the hyperscale data center market, IT & telecom sector accounted for over 45% of the industry share and is witnessing high adoption of the large-scale infrastructure facilities owing to the increase in data generation and storage requirement. Telecom operators are offering flexible internet or data plans, which is driving the data traffic. The rapid increase in data generation is encouraging the businesses to implement highly scalable and efficient IT environment with high computing power, thereby accelerating the market growth. Global telecommunication companies are establishing mega infrastructure for catering the widespread customer base. For instance, in July 2017, China Telecom announced its plan to expand the data center capacity in Hong Kong and add more Points of Presence (PoPs) in North America, as a strategic initiative to penetrate in the international market. It has widened the network coverage in the region with three new PoPs at Oregon (U.S.), Illinois (U.S.) and Quebec (Canada) facilities. Such IT expansions are predicted to drive the hyperscale data center market demand. The Western European and Nordic markets are experiencing high demand for hyperscale data centers owing to the easy availability of renewable energy sources, land for development, tax incentives, strengthening fiber connectivity and reduction in electricity cost. These factors are helping cloud service providers to focus on constructing more hyperscale data center in Western Europe. For instance, In June 2018, Google announced its plan to launch its hyperscale data center in the Netherlands due to the availability of sustainable energy sources which will help to lower the energy costs for data centers. In October 2018, Alibaba expanded its cloud computing business in the UK and Germany. Such initiatives will contribute to the hyperscale data center market growth in Western Europe & Nordic region. Key players operating in the hyperscale data center industry include Broadcom Ltd., Cavium, Inc., Cisco Systems, Inc., Dell, Inc., Huawei Technologies Co., Ltd., IBM Corporation, Intel Corporation, Lenovo Group Ltd., Microsoft Corporation, NVIDIA Corporation, Sandisk LLC, and Schneider Electric SE, among others. Players in the market are manufacturing business-specific solutions which enables customers to customize solutions based on enterprise requirements. Moreover, increasing technological advancements and innovations in various industry sectors are expected to be a major contributor for the market growth.